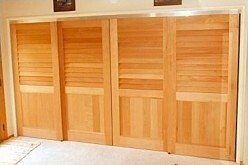 I learn more about the track of sliding closet doors from this article! And now also know how to choose or decide which kind track system should be use. Thanks a lot! Where can I buy a 3 door track? We offer the 111MD Johnson Sliding Door hardware where each track is separate so that you can put 3 doors on 3 different tracks. This way you can stack all of the doors 1 behind the others. I hope this helps. If you should have any questions concerning the sliding door track hardware please let me know.